Petitpren Inc. is an Equal Opportunity Employer. Back in 1933, Petitpren Inc. had 3 employees, the company’s founder Frank, and his sons Stan and Fran. Working out of a six car-garage, the beer was delivered out of the back seat of the family car. Now, more than 75 years later, Petitpren Inc, has grown into a operation of 86 full-time employees and 79 part-time employees and a fleet of over 175 vehicles. Petitpren Inc. has earned a reputation in the communities it serves as being a employer that excels in training, motivating, and retaining its employees. Service assigned retail accounts managing inventory of Petitpren Inc. products. 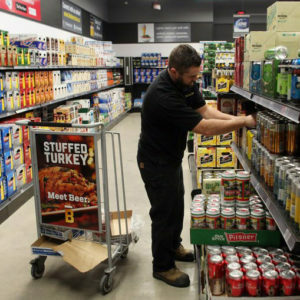 Assist and build creative displays, rotate all packages to maintain product freshness, assist resetting cooler and warm beer sections, and accurately perform record keeping task. Write accurate orders for assigned Meijer stores. To apply for this position, please fill out our employment application.